Three Girls: Eleanor Jane Adams! 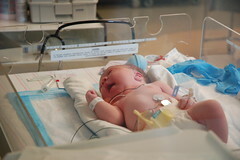 Eleanor Jane Adams was born this morning, September 10th, 2007, at 8:34AM. She weighed 8lb. 6oz., and was 21" long. Both Brooke and the baby are doing very well. Eleanor had to spend a little time in the transitional unit initially because of some leftover amneotic fluid in her lungs, but she is recovering well. As I write this, we're expecting her to arrive at our room any moment. Brooke and I are overjoyed! Congratulations, Brooke, Andy and Anne Marie!! The Estepp family is so happy for you and can't wait to see your new baby girl and her big sister. It's been too long since we've gotten together, Andy. I didn't even know y'all were expecting again. We need to get together after you're back at work. Y'all take it easy and enjoy this time! Congratulations! We will be thinking about you all over the coming weeks. I can't wait to meet little Eleanor. Congratulations on the new baby girl!! We are so happy for you. She is so precious!! Way to go Brooke! Good assist Andy. Mucho, mucho congratulations. I'm glad that Eleanor Jane is off to a good start. CONGRATULATIONS, ADAMS FAMILY! I would love to see you guys if you're in Kingsport--we need to get our girls together. Enjoy Miss Eleanor and keep those pictures coming! Yipeeeeeeeeee! Congrats on the latest Adams! Welcome Little one, you are blessed to be born into this family, for whom love knows no boundaries! Praise the Lord! Another sweet Adams girl! I can't wait to hear the birth story. Wow!!!! I can't believe she is here already!! And everyone is OK!!! Congratulations - you and Brooke are so blessed!!! Thank you for sending me an announcement!!! Can't wait til' Thanksgiving - hope to see you all then!!! Congrats from the Pearsons! Can't wait to meet your new little girl! Welcome to the world, Eleanor! Congrats, other Adamses! Very exciting, I'm happy for you guys! Hi! Laura let me know about the new baby girl! I love, love, love the name you picked out; it's gorgeous! Congratulations! Yay!! Welcome Eleanor! Thanks for the cute pics. We are thrilled for you. Congratulations! Robyn and I are happy for you all. We hope to get to see both the girls sometime soon.